The file Sample.ibd is currently about 93GB, with more than 600GB free space available on the partition, so it's not a disk free-space issue. Neither it seems to be hitting any kind of file-system limit (I'm using ext4). I'd be grateful for any ideas what could be the cause, or what to investigate. Update: I'm using mysql Ver 14.14 Distrib 5.1.66, for debian-linux-gnu (x86_64). You said you are using ext4. File size limit is 16TB. Thus, Sample.ibd should not be full. You said your innodb_data_file_path is ibdata1:10M:autoextend. Thus, the ibdata1 file itself has no cap to its size except from the OS. Why is this message coming up at all? Notice the message is "The table ... is full", not "The disk ... is full". This table full condition is from a logical standpoint. Think about InnoDB. What interactions are going on ? My guess is InnoDB is attempting to load 93GB of data as a single transaction. Where would the Table is Full message emanate from? I would look at the ibdata1, not in terms its physical size (which you already ruled out), but in terms of what transaction limits are being reached. 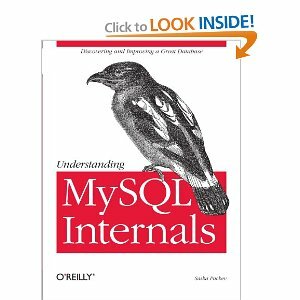 What is inside ibdata1 when innodb_file_per_table is enabled and you load new data into MySQL? My suspicions tell me that the Undo Logs and/or Redo Logs are to blame. The InnoDB engine keeps two types of logs: an undo log and a redo log. The purpose of an undo log is to roll back transactions, as well as to display the older versions of the data for queries running in the transaction isolation level that requires it. The code that handles the undo log can be found in storage/innobase/buf/log/log0log.c. The purpose of the redo log is to store the information to be used in crash recovery. It permits the recovery process to re-execute the transactions that may or may not have completed before the crash. After re-executing those transactions, the database is brought to a consistent state. The code dealing with the redo log can be found in storage/innobase/log/log0recv.c. There are 1023 Undo Logs inside ibdata1 (See Rollback Segments and Undo Space). Since the undo logs keep copies of data as they appeared before the reload, all 1023 Undo Logs have reached its limit. From another perspective, all 1023 Undo Logs may be dedicated to the one transaction that loads the Sample table. Note that in 5.0 (pre-5.0.85) and in 5.1 (pre-5.1.38), you could receive the "table is full" error for an InnoDB table if InnoDB runs out of undo slots (bug #18828). This will put an explicit COMMIT; after every INSERT. Then, reload the table. This will make each INSERT have just one row. The mysqldump will be much larger (10+ times bigger) and could take 10 to 100 times longer to reload. In either case, this will spare the Undo Logs from being inundated. If the InnoDB system table (a.k.a ibdata1) strikes a filesize limit and Undo Logs cannot be used, you could just add another system tablespace (ibdata2). Note that ibdata2 grew to 2196875759616 which is 2145386484M. In 40 hours, ibdata3 grew to 31G. MySQL was once again working. I had the same problem and I just did one thing and it worked. Important Note You cannot host more than 512MB of data in all InnoDB tables combined. You can also switch to an innodb-per-table scheme using innodb_file_per_table. Not the answer you're looking for? Browse other questions tagged mysql innodb mysql-5.1 or ask your own question. How to interpret the information spit out by innochecksum? Incorrect information in .frm file after a power outage? Can't start MySQL server because of wrong file permissions? Why is MySQL MariaDB GREATEST(timestamp,NOW()) padding appending results with zeros?